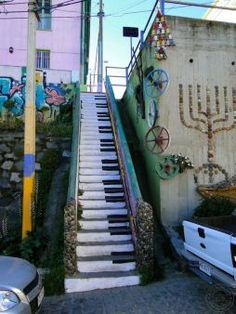 Whoever painted these piano stairs must have a creative mind and a love for music. It’s such a simple concept, but packs a serious punch. It looks as though just the riser parts of the steps have been painted white with a simple black stripe. But, anyone standing at the bottom of the stairs can look up and see a giant piano keyboard. I imagine that the stairs would look like this when walking up them as well. I’d definitely say that these don’t just blend into the background any longer! It would be hard not to notice these stairs when walking by, and even harder to stop yourself from climbing them. Love these piano stairs? Head over and check out his mountain stair illusion!